On 18 April, seventy years since VE Day (WW II Victory in Europe) Corporal George Shenkle of the 508th Parachute Infantry Regiment will be reunited with the C-47 he jumped out of on D-Day, June 6th 1944. The mission of George and his fellow paratroopers that day was to seize and hold the vital crossroads town of St. Mere Eglise, France, making it one of the first towns liberated during the invasion. Mr. Shenkle will be visiting the AMC Museum from noon until 4 p.m. to be photographed and recorded by Andy Marchese for the American Veteran’s Project. He will also be available to speak to visitors and will have copies of his book “My Clear Conscience” available to autograph. Mr. Shenkle also jumped into Holland during Operation Market Garden (the movie “A Bridge Too Far”) and he fought in the Battle of the Bulge. He was awarded the Bronze Star and the Purple Heart among his decorations. The AMC Museum has the original jump manifest listing George’s name on it that will be on display on the 18th. 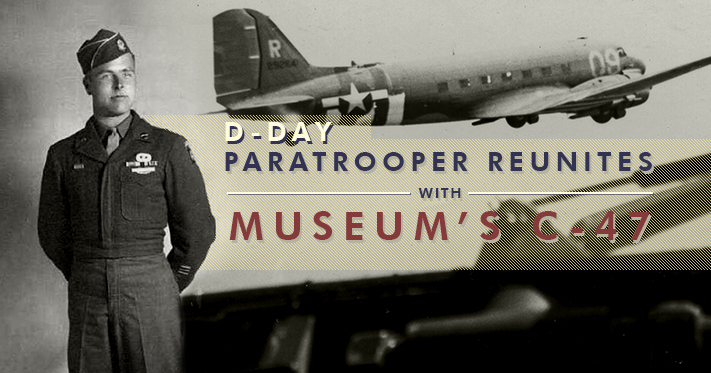 Private David Akers, a medic and the only other confirmed survivor of the D-Day jump from this aircraft may also attend the event, if able. As a highlight both Paratroopers have been invited to sign the aircraft just as they did before climbing aboard on D-Day. Photography is encouraged as this historic event will not likely be repeated.